Those worried that Disney’s Hall of Presidents might be getting a yuge update in the near future can go ahead and breathe a small sigh of relief — for now. Supposedly, instead of getting a remodel, the attraction is going to revert back to an early version. Here’s what you need to know: There’s an attraction at Walt Disney World in Orlando, Florida about the United States Presidents. It is called, The Hall of Presidents, fitting! The 20-minute long attraction features an audio-animatronic version of every single U.S. President, ranging from George Washington up to Barack Obama. While the attraction has been open in the park since 1971, the sitting Presidents didn’t start talking to us until 1993 — because it’s not like Disney could get George Washington’s *real* voice, you know? Since the Bill Clinton era, toward the end of the show the current POTUS has given a ‘lil speech. Clinton did it, George W. Bush did it, and more recently, Obama gave a pretty moving speech (that didn’t make me cry or anything). It expected and assumed that when Donald Trump was elected to the highest office, an audio-animatronic for him would also be included in the attraction. It’s Disney’s tradition, it makes sense. The attraction is currently closed for refurbishment, set to reopen just before July 4th (lol, fitting). But now, the word on Main Street U.S.A. is that when it opens, President Trump will not give any sort of speech at the end of the show. 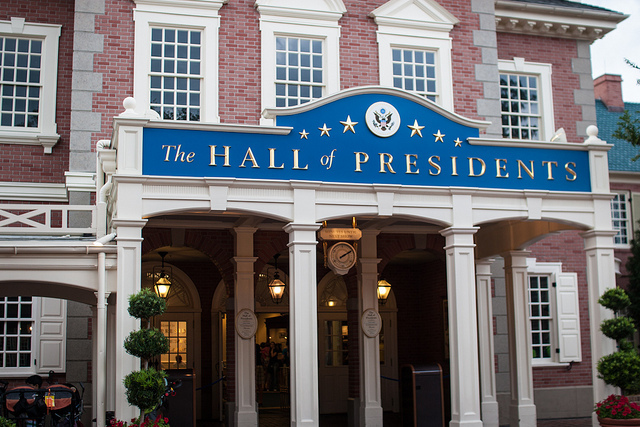 Instead, The Hall of Presidents will go back to an earlier version before the Commander on Chief started talking to Disney World guests. "Given how polarizing the president is right now, Disney Parks & Resorts is currently trying to find [a solution] that approaches middle ground. They want to include our 45th commander-in-chief in this 45-year-old theme park attraction, while at the same time, not seem to endorse or support some of Trump's more controversial policies." The source believes that the re-opening date of the attraction might even be pushed back to the fall (hey, news is changing every day, so this kinda makes sense), and also POTUS hasn’t had a free moment to record his voice-over. "I guess there's also been some back-and-forth on his proposed script," they continue. "They're hoping to use as a 'Get Out of Jail Free' card. If he's not available to record, they can use that as a legitimate excuse… that's kind of what Disney's hoping for." Remember, this is just a rumor, and Disney hasn’t confirmed this change to the attraction in any way. Sounds like you’ll still be able to find our current POTUS inside, he’ll just be slightly out of character: silent.